Daniel “Dan” Gene Collins, 82, Mesa, AZ, husband, father, grandfather, great-grandfather, brother, and a friend to everyone he met, passed from our presence on Saturday, April 1, 2017 after a sudden illness. Dan was preceded in death by his parents, Chester and Jennie Collins, sisters June and Katherine, brother Elmer, first wife Nancy B. Platts Collins, second wife Norma Nelson Brooks Collins, and daughter Penny Rose. He was survived by his brother John Collins, wife Anneva Whipple McCain Collins, children, Alice Ormiston, Chuck and Kathy Collins, Kirk and Sue Collins, 10 grandchildren, and 15 great-grandchildren. Dan was born in Neodesha Kansas, but spent a fair amount of time in Oregon as a child. Dan served in the Air Force during the Korean Conflict. He raised his 4 children with his first wife, Nancy, in Washington. Dan met Nancy when they both worked at Boeing. For a while Dan worked at the Hanford Nuclear Power Plant in WA. Dan retired from Boeing in 1997. After the passing of Nancy, Dan married Norma. They split their retirement days between Mesa AZ and Burien WA. They welcomed their beloved dog, Charlie. Dan and Charlie were travel companions and made many airplane trips together. Dan married Anneva after the loss of Norma. Dan was a devout member of The Church of Jesus Christ of Latter-day Saints for over 50 years. 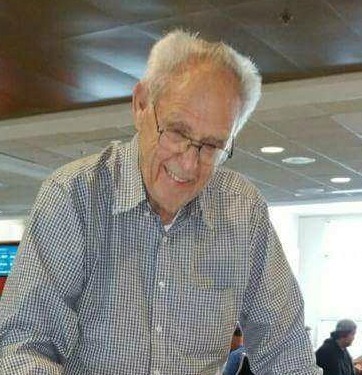 He loved doing genealogy and had served at the Seattle Temple. Funeral services will be Saturday, April 8, 2017 at 11 am at The Church of Jesus Christ of Latter-day Saints 5620 East Adobe Road MESA, Arizona 85205 Interment will be in Everett WA. My sincere condolences to the Collins family on the loss of your dear loved one. Death can bring so much tears and pain but may your memories bring you comfort in the days and weeks ahead and have faith in God’s promise found at Isaiah 25:8. My deepest sympathy to you all during this difficult time.